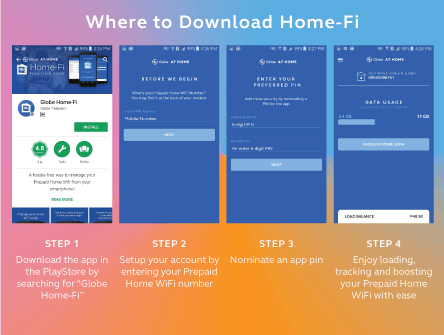 Globe At Home has provided easier access to the reliable internet with the first ever Prepaid Home WIFI, which lets customers enjoy internet speeds 50% stronger than regular mobile WIFIs. It offers fast and reliable connectivity with no installation and monthly fees. The experience gets even better through the new Globe Home-Fi app that allows customers to manage their accounts easily. The Home-Fi app lets one load credit charged to any Globe mobile number, track total data usage consumed by those who connected to the device, as well as boost data allocation by allowing one to register to surfing promos right away. The app will also notify users once their data allocation has been consumed. “We are happy with our customers’ positive feedback on the Globe at Home Prepaid Home WIFI. This is why we want to make their experience even more seamless with the introduction of this convenient Home-Fi app. This way, any member of the family can easily reload, subscribe to promos and even track the usage. The Home-Fi app ensures easier usage and maintenance of the device,” says Martha Sazon, Senior Vice President of Globe At Home. Since last year, Globe At Home has aggressively rolled out to more areas in the country. For locations where facilities are underway, customers can still experience fast internet speeds with the Globe At Home Prepaid Home WIFI. Now the with Home-Fi app, management of the prepaid device is made easier and more convenient. The Home-Fi app is available for download on the Google Playstore. After downloading, set it up by entering the Prepaid Home WIFI number and adding a preferred PIN for security measures. Once done, users can start tracking their data usage, load, and easily subscribe to promos. The Globe At Home Prepaid Home WIFI is available in Globe stores nationwide for just P1,999 and it comes with free 10GB of data.